THIS HOTEL IS 100 percent NON SMOKING The Embassy Suites San Antonio-International Airport offers a complete full-service all-suite hotel experience in a prime locale just half a mile from San Antonio Airport and seven miles from downtown San Antonio TX. Travel Texas and reserve your stay at this San Antonio hotel to experience the luxury of spacious two-room suites attentive service from our professional staff and extensive amenities perfect for San Antonio Texas vacations. Situated centrally among San Antonio airport hotels this deluxe hotel offers convenient access to the city*s most popular attractions including AT-T Center the Alamo North Star Mall Riverwalk/Downtown San Antonio Zoo Seaworld Six Flags Fiesta Texas Splashtown USA Trinity University and University of Texas at San Antonio. 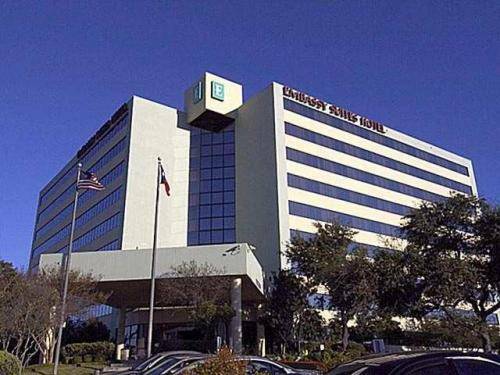 When searching for hotels near San Antonio airport choose the Embassy Suites San Antonio-International Airport where you can return to your relaxing San Antonio lodging after a full day of thrilling activities to unwind and prepare for your evening. Head to our soaring atrium lobby to enjoy complimentary beverages and light snacks at the nightly Manager*s Reception courtesy of our San Antonio airport hotel. For a sumptuous meal Ellington*s our onsite restaurant serves delightful international cuisine in a casual ambience. If you prefer to dine in the privacy of your suite our room service staff is happy to deliver a delicious meal to your door. In the morning our guests are treated to a complimentary cooked-to-order breakfast guaranteeing a great start to the day. To secure the best rates for hotels near San Antonio International Airport check our specials and deals for valuable San Antonio Texas vacation packages. Book your stay now at the official Embassy Suites San Antonio-International Airport site to benefit from secure booking and our Best Available Rates Online. All reservations must be guaranteed with a major credit card or advance cash deposit to hotel regardless of time of arrival. All reservations must be cancelled 24 hours prior to arrival unless deposit is required. Policy subject to change. Whether eating in the Bar or on the go guests can order at E*terie an know the team takes care to prepare quick and fresh meals and sharable bites. At the bar guests will enjoy craft cocktails local beer on tap and wine from around the world. ~67 miles from San Antonio.